As Global Disciples, we want to see every person have an opportunity to choose and follow Jesus Christ. That’s our vision and our passion. And with over 2 billion people who have not yet had that opportunity, we want to be part of God’s strategy for change. 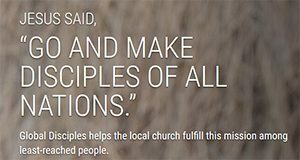 The commission Jesus gave His followers is simple, “Go and make disciples of all nations” (Matthew 28:18-20). So we work through the local Body of Christ in over 45 countries, to assist them in fulfilling this commission. How? By working with the local church to train their trainers. We empower their selected leaders to develop a sustainable way to train disciple-makers, equipped to share the Gospel and plant churches among the least-reached. See how it works, when you meet Raj. Global Disciples also provides training for trainers in small business and leadership, to give disciple-makers and church planters with a means of support and access in often difficult areas, and to strengthen leaders as new churches multiply. Get to know Global Disciples better.